Sorry for posting late but I'm on holidays away from my normal computer setup and this is the first chance I've had to get onto my blog. 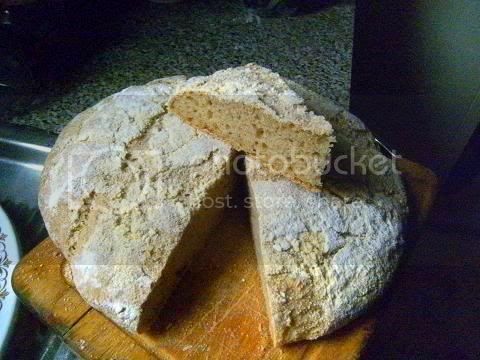 This month's Daring Bakers' challenge was sourdough, yes sourdough and yes we were asked to make a fresh starter for the challenge. I have a decade old starter called Boris (100% hydration i.e. 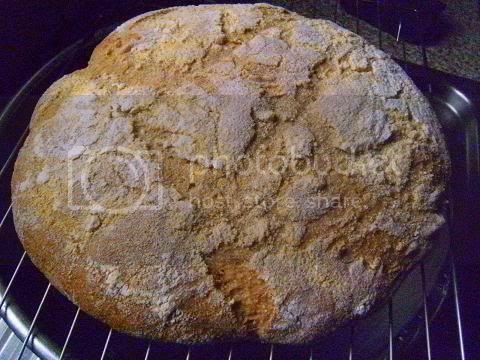 equal weights of water and plain bread flour) so I decided to use that to make the French Country Loaf recipe. I started the process at Day 4 in the instructions. Since I had Boris already made up I saved four days. 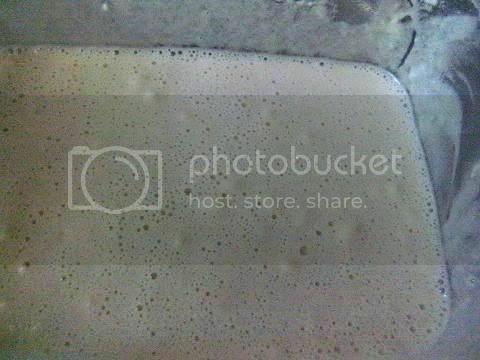 I have started a new sourdough starter to use in a few days time. 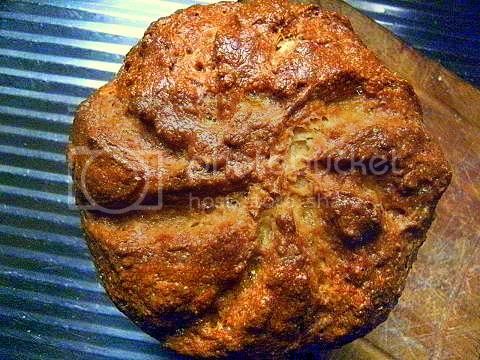 In Sydney Australia it is the start of summer so I made a stuffed picnic loaf with the baked bread one of my favourite summer picnic foods. 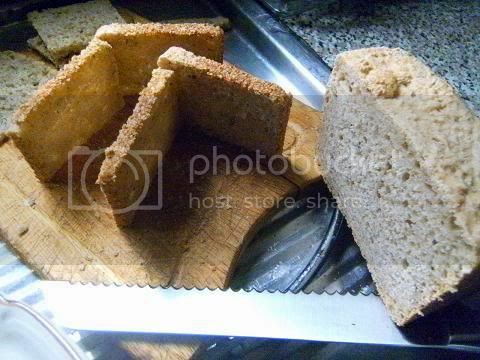 I used "OO" finely steel-milled bread flour and "OO" finely cold-steel-milled whole wheat flour with some stabilised wheat germ (since I couldn't find my stone ground flour). 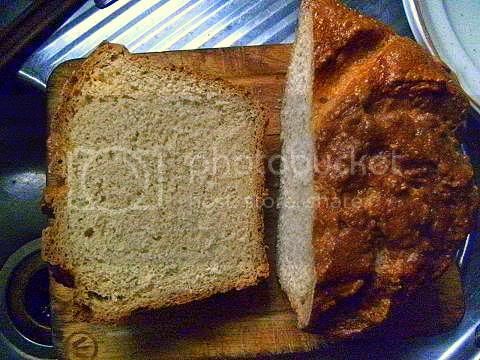 Comparison of Boris (left) when he is made into the leaven for the sourdough (right) in the French country loaf. 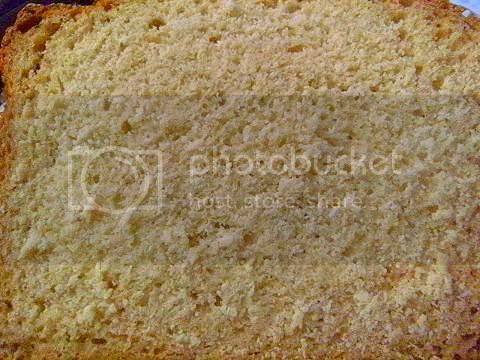 Notice how wet and soft the leaven is for this recipe! The loaf proofing for the final raise in a greased pan (I didn't want flour on the outside of the picnic loaf) before it is tipped out and slashed. 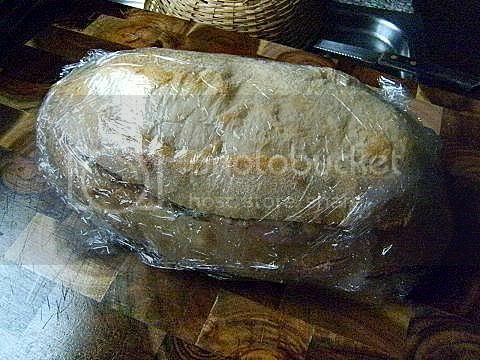 The unbaked loaf is very soft and needs a mould. 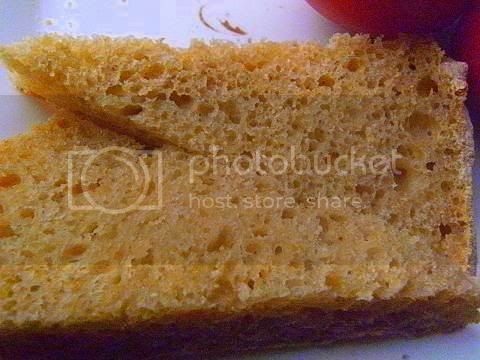 The baked loaf (the unbaked loaf is very wet and soft and forms a great shape when baked) the final loaf shape is formed by squeezing (the soft out-turned unbaked loaf) with your hands, then you quickly slash it and place immediately into a very hot oven and turn the temperature to hot for 10 mins and then to the recipe temperature for the rest of the time. 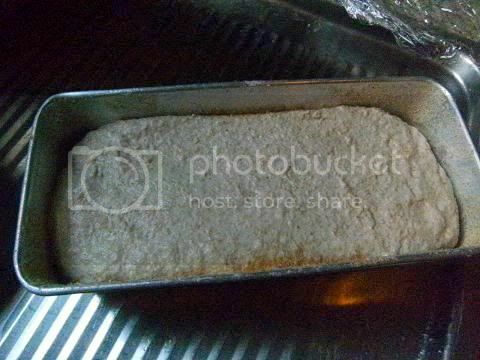 Hollow out the loaf, notice how moist the interior is and the 'greyish' colour which is a indication of the sourdough starter. 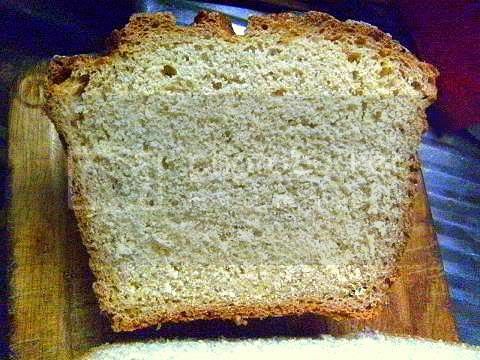 The crumb (the texture of the interior) of the loaf is like dense sponge really good I thought, notice the dense spongy crumb in the hollowed out top of the loaf (bottom piece in the photo below). 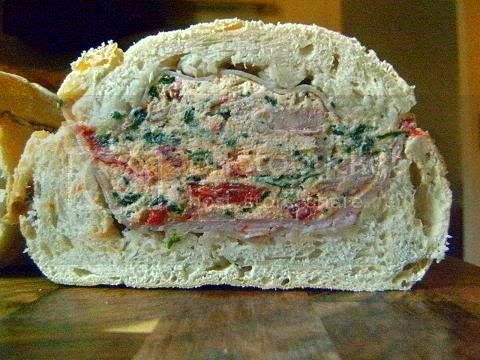 Line the hollow with several layers of thin ham, and then fill with a combination of ricotta cheese, chopped charred-grilled red capsicums (fire-roasted red bell peppers), spinach, basil, finely chopped spicy smoked French sausage, grated sharp cheese and lots for black pepper. 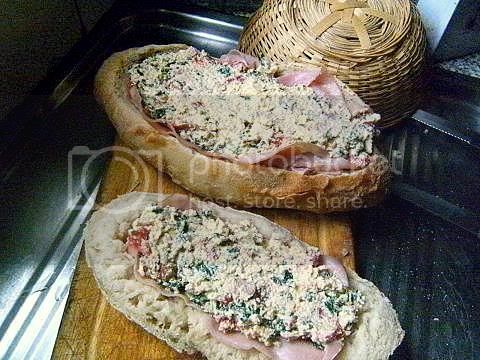 The filling ingredients can be varied to suit your own tastes a great version is the famous Muffuletta sandwich (the filling is an olive paste with various cheeses and sliced meats). The verdict - this recipe produces a sourdough unlike anything I have done before the crumb of the loaf is very moist almost sponge-like which I really really liked and it is a perfect foil for the pressed filling ingredients since they almost have the same texture which is what you want in a picnic loaf. 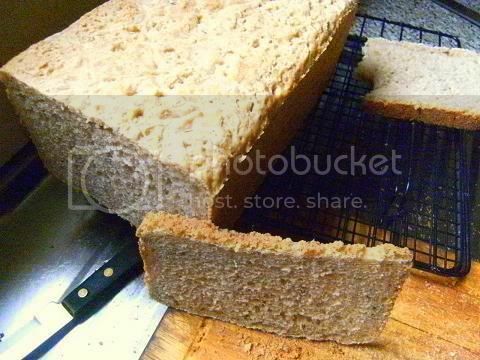 Also the picnic loaf slices cleanly and thinly. 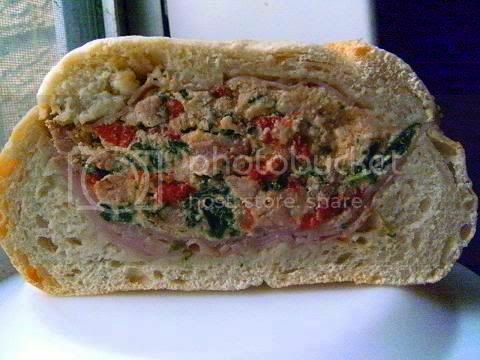 I bet for an extra special treat slices of this picnic loaf would fry up beautifully. 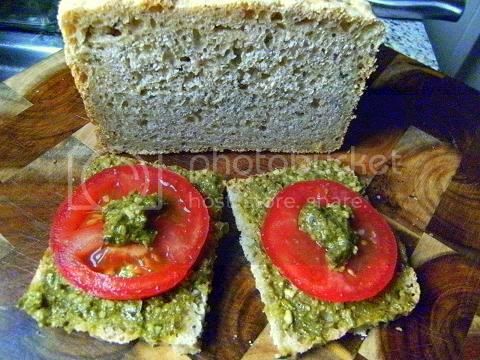 I will be using this recipe from now on to make picnic loaves. 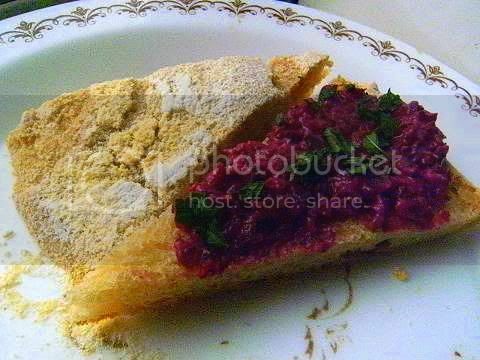 You can make a lot of recipes with the leftover starter examples pancakes, cakes, scones etc. 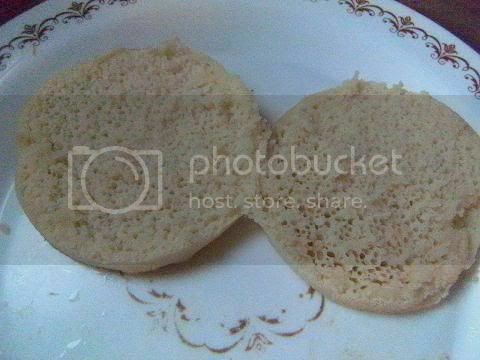 In this case I made crumpets with the leftover starter (To make the batter - to one cup of starter, sprinkle over the surface 1 teaspoon of sugar and 1/2 teaspoon salt and 1/2 teaspoon baking soda (or 1-1/2 teaspoons of baking powder), stir well, the mixture will double in volume. 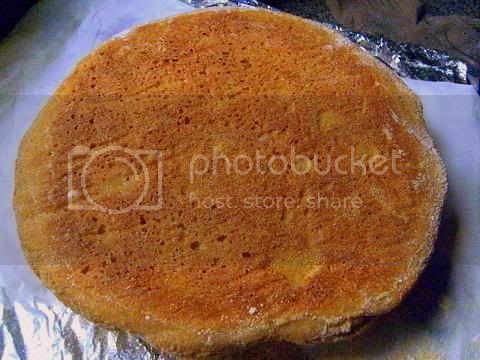 Dry fry 1/4 cup scoops of the batter in well greased 3" (7-1/2 cm) metal rings on a medium-low heated griddle (or fry pan) for 4-6 minutes on the bottom and optionally 30 seconds on the top if you like colour on both top and bottom of your crumpets.) 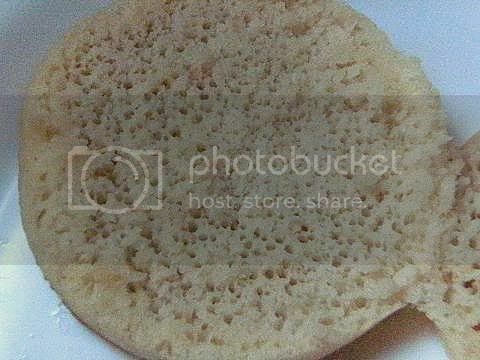 These crumpets were so good I love how the holes form and the moist texture of the crumb so much better than the store bought version. 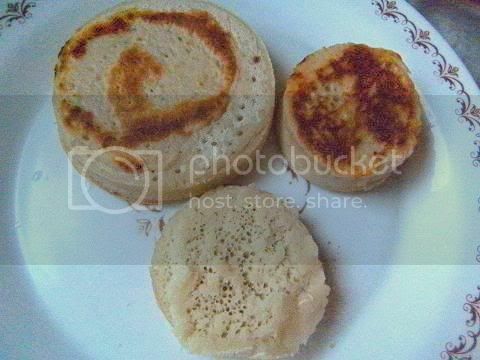 You can freeze the leftover starter/leaven and the cooked crumpets. 1. 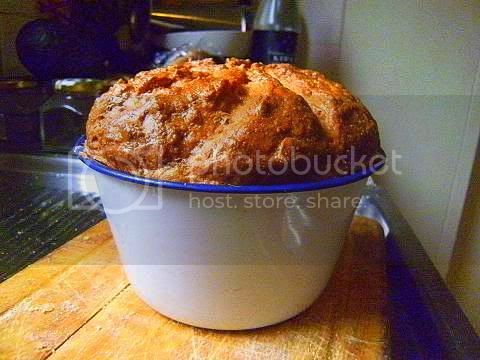 This recipe is unusual in that you knead the leaven into the dough. 2. 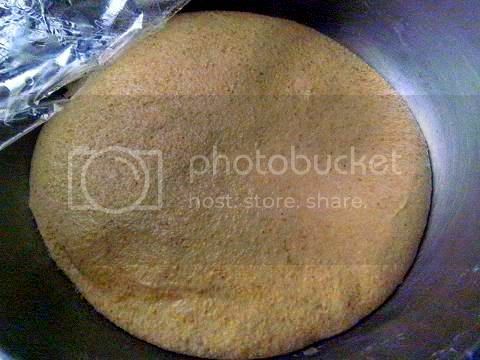 The leaven is very wet and soft more like soft putty so when you form the disk of dough and place the leaven onto it and knead it, the final dough-making is incredibly messy and the final dough is very very soft and spreads out very slowly (takes about 20 mins) if left on the counter. 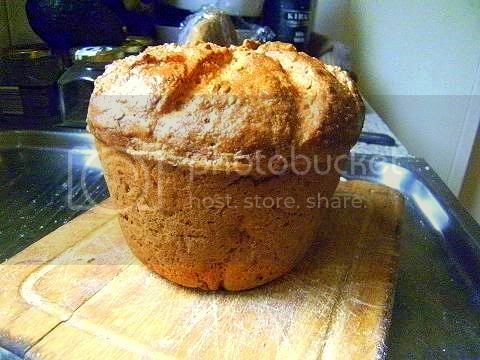 I had to add about 3 tablespoons of extra flour to make it a little stiffer. 3. 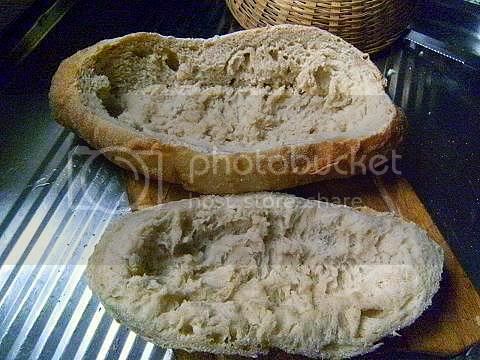 The final interior of the loaf is very moist, as compared to my normal sourdough. I really liked the final interior and the loaf. 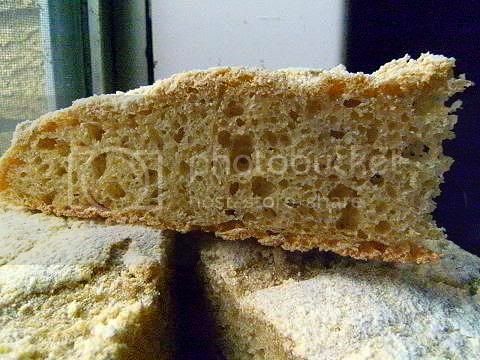 The crumb (the texture) of the interior was like soft dense sponge even slightly doughy which I really liked. The weight of the loaf feels very heavy for its size. 4. 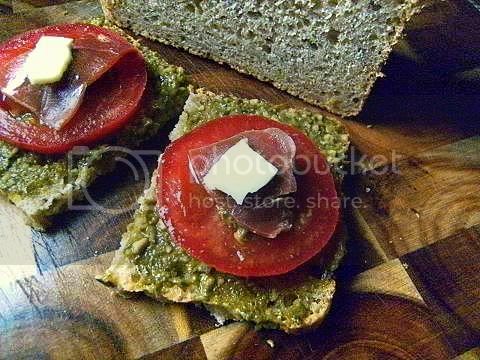 What to make with the leftover starter make crumpets see links below for the recipe. 5. 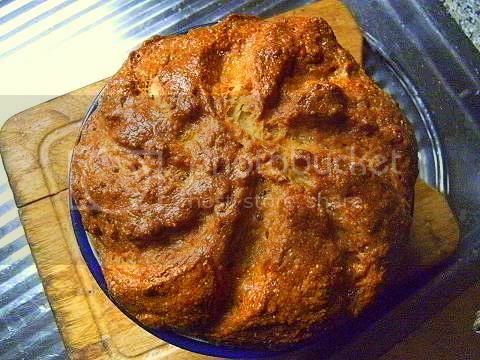 A plain flour starter seems to work very well for this recipe. I made the French country loaf its starter was very easy to make and look after until it was active it only took three days for the starter to become super active since I feed it twice a day and the starter was in a moist warm environment for the entire 'brewing' time. 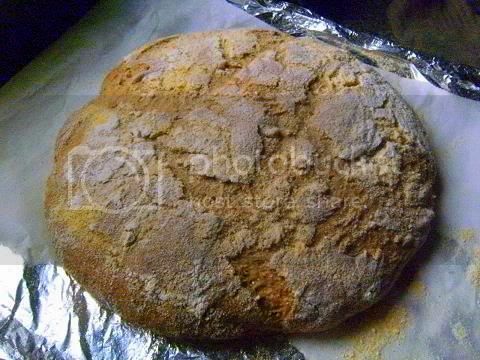 I made up the loaf has per the recipe I used very coarse stone ground whole meal bread flour and "OO" finely milled bread flour. The dough rose in about 2 hours (really quick for a sour dough) and to twice it original volume and when baked stayed exactly the same size. 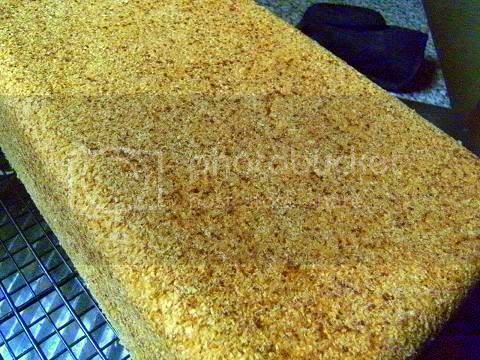 Since I used such coarse flour the final texture of the crumb was very grainy. 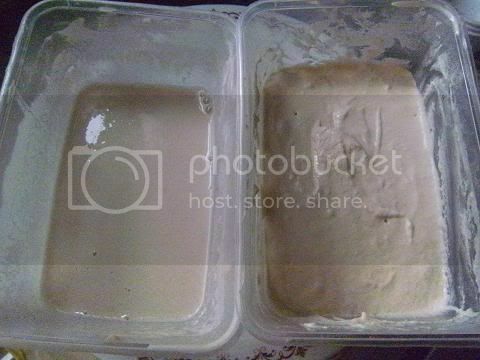 My dough was so wet and soft it really needed a mould but that was no problem. 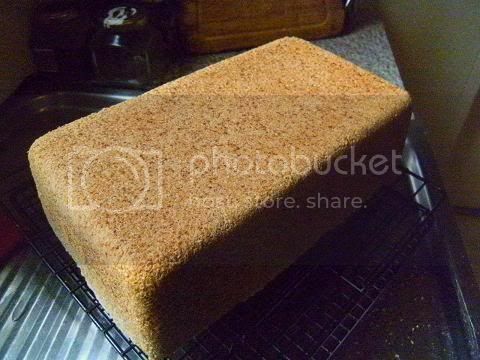 I wanted perfectly shaped sandwiches which means the crust has to be very smooth with crisp edges, so I went for a 'brick-shape' loaf that could be cut thinly and cleanly while having the strength so the bread slice wouldn't break or bend when the sandwich is being eaten. 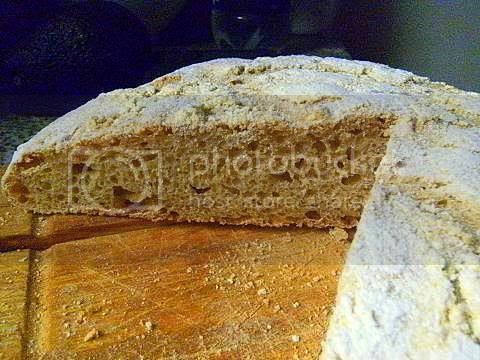 The final texture of the loaf was like a Rye European sour dough bread, not dense at all in fact, the loaf could be cut very thinly and cleanly - perfect for open-faced sandwiches. I had the most beautiful tomatoes and basil so I had to use them as the topping for my sandwiches. 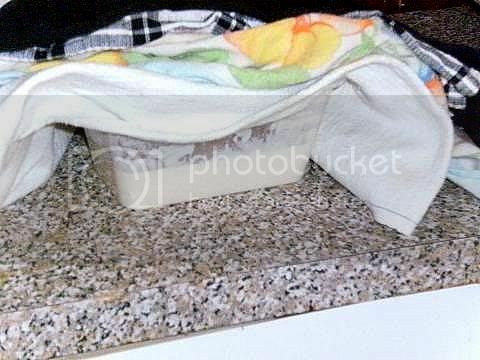 This summer in Sydney Australia has been the coldest in the last fifty-one years, so I took special precautions in keeping the starter warm that is by enclosing the plastic container in several tea-towels on the counter on the spot that is above the hot water system. The temperature was gorgeously warmish at all times, so after three days the starter was full of energy and going for it. 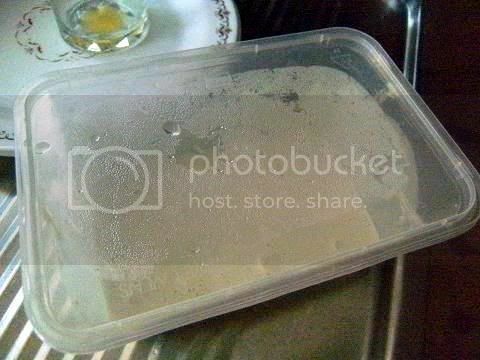 If you feed the starter once in the morning and in the evening it shortens the time for the starter to become active. 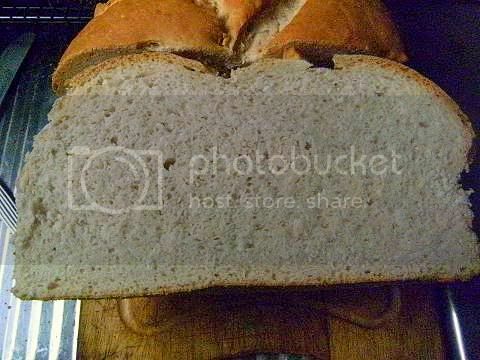 Notice the nice straight edges and smooth faces on the loaf, it looks like a brick! 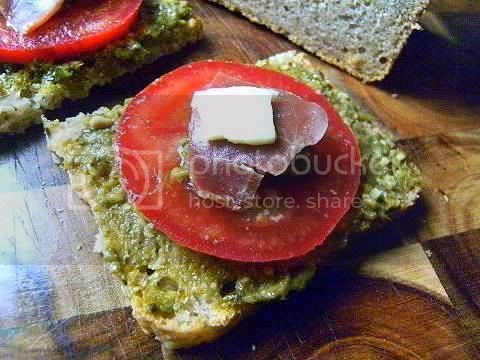 Perfect for open-faced sandwiches. 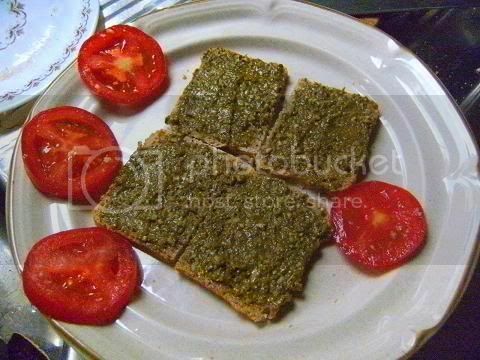 The verdict - a very tasty open-face sandwich bread wonderful with the tomatoes and pesto. And so filling only a couple of quarter slices where enough. Just like the old fashioned country breads I had in my childhood. 1. 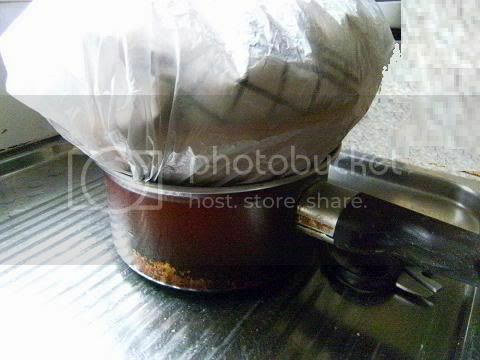 You can speed up the 'brewing' time of the starter by twice feeding it a day and making sure that the starter is in a moist warm place. 2. My starter was super active it rose the dough in about two hours which is very quick. 3. 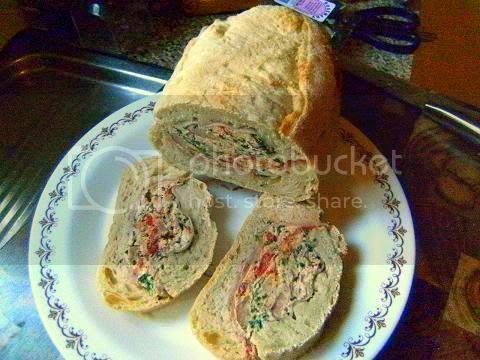 The final dough was too soft to be shaped into a free-form loaf it really needs a mould. 4. 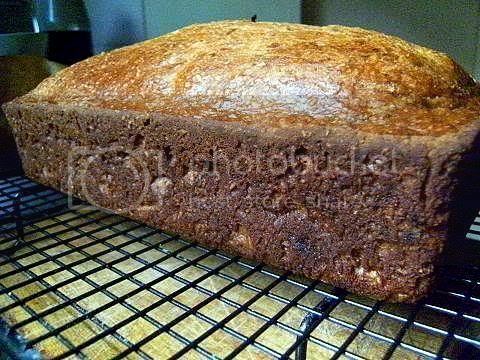 The final crumb is very much like the classic black bread style of Northern Europe. 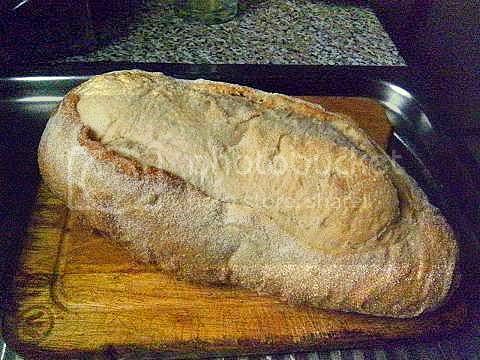 I used the French Country starter to make a cornmeal soudough loaf that was more traditionally shaped. 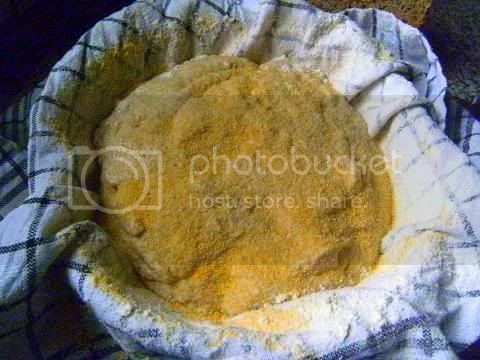 I replaced the whole meal flour with corn meal (polenta) I added some pure gluten flour to replace the missing gluten from the corn meal and raised the dough in a bowl lined with linen that was covered in flour and cornmeal. 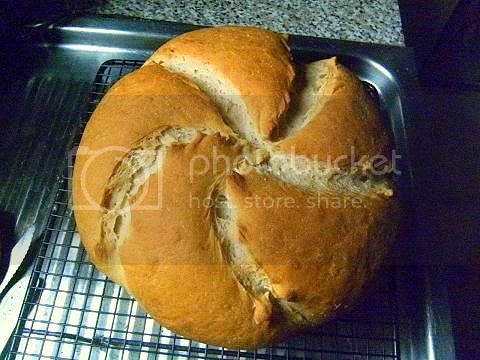 This is the largest loaf of bread I have made it was 12 inches (30 cms) in diameter and weighed almost 2-1/2 kgs (5-1/2 lbs)! It took about an hour and a quarter to bake. 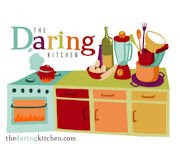 How to raise the dough during cold weather, place a plastic bag over the bowl and place that over a saucepan 3/4 filled with warm water also you can wrap the saucepan in tea towels this will keep your dough warm for many hours even overnight. 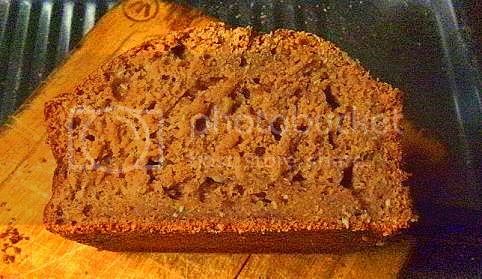 I will use the loaf tomorrow after it has cooled down and the flavours have settled. 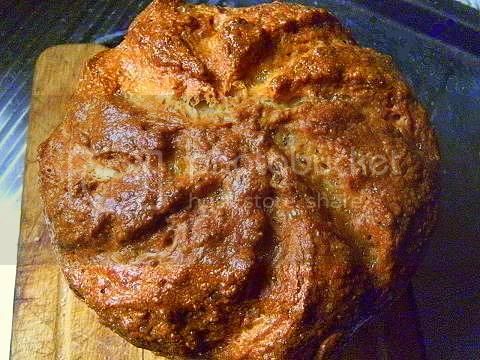 I love the look of this loaf so rustic with lots of character in the crust and the yellow colour is stunning. 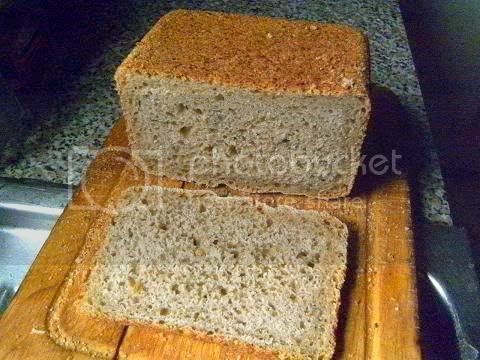 I use my cornmeal sourdough loaf today I was extremely pleased with the look, taste and texture of the slices. 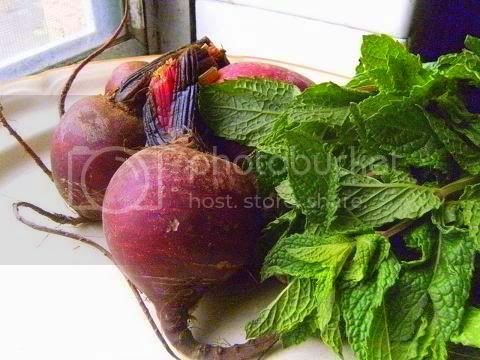 I had some beautiful beet(root) and mint on hand so I made a spicy beetroot mint dip to serve with the cornmeal bread. One thing about sourdoughs is that they can look so beautiful as compared to the store bought loaves. 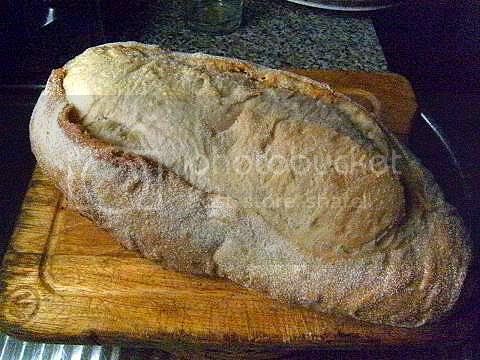 I made another loaf using the French Country starter but using all white flour for the loaf. 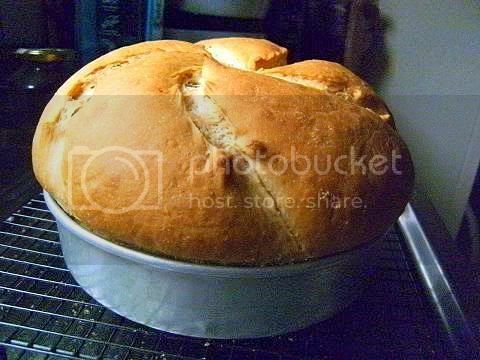 I had to add about 1/4 cup of extra flour to the dough so that the shaped loaf would hold its shape and be slashed. 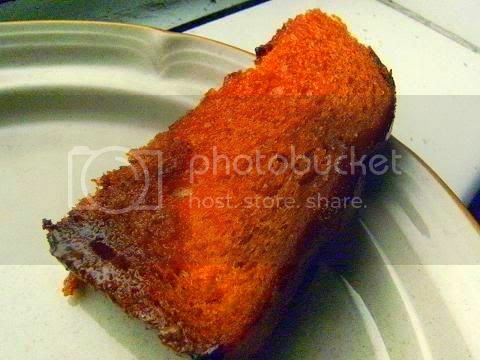 I double egg-washed the loaf which really gave the baked loaf a lovely shiny gloss finish. 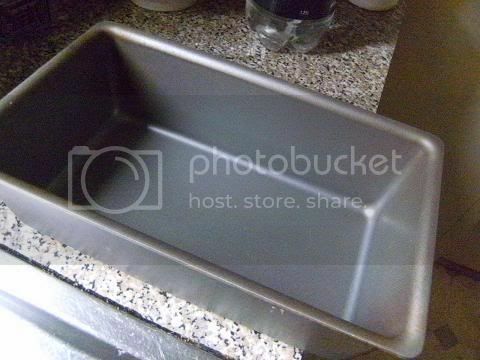 I will use it tomorrow after the loaf has had time to settle and mellow. I cannot wait. 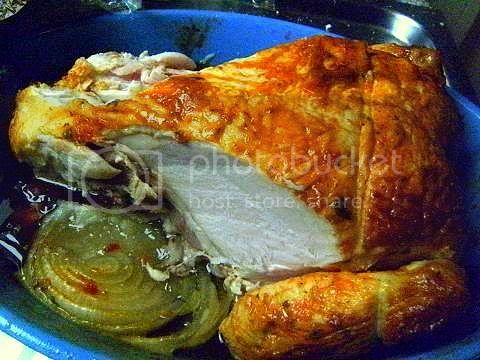 I made tandoori roast chicken to serve with the white sourdough loaf I had made yesterday. 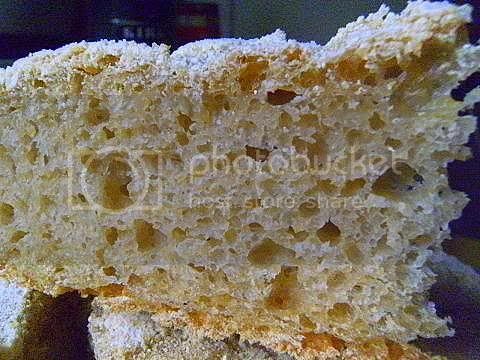 The crumb of the sourdough was very smooth and its hue was a light sand colour which was unexpected since I used a very white flour for the dough. 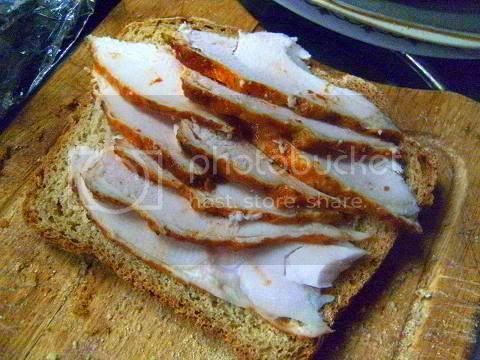 The thinly sliced chicken was lovely on the sourdough sandwich. 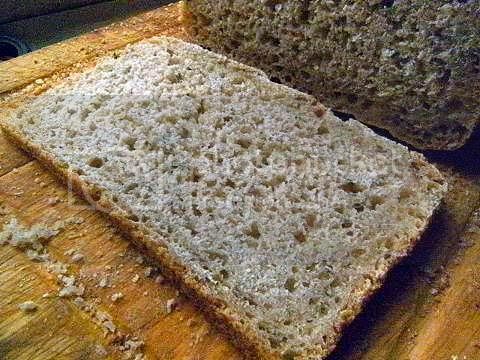 The crumb of the loaf was very similar to white wonder bread a wonderful bread for sandwiches. I repeated making a white flour sourdough but this time I added some more flour in the final stage so that the loaf would spread out so much and would hold it shape when slashed. I needed about 1 cup of extra flour to achieve the correct consistency. I was very pleased with the final result. The loaf expanded about three times it was incredible to watch it grow and bake in the oven. 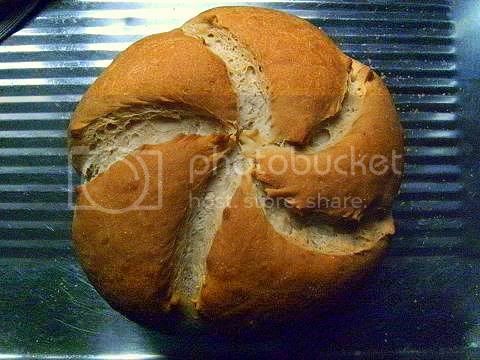 Sift together the flour, baking powder, baking soda, milk powder and salt, form a well in the centre of the dry ingredients. 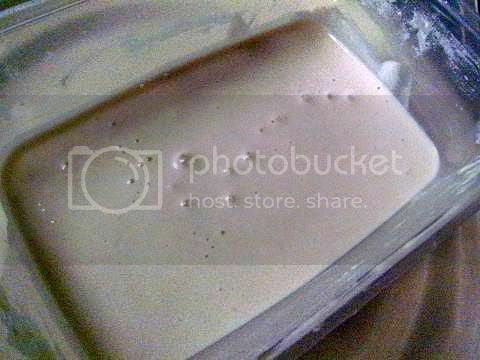 Pour into the well the sourdough starter, oil, wheat-germ, egg, brown sugar, banana and dates (and the nuts if using). 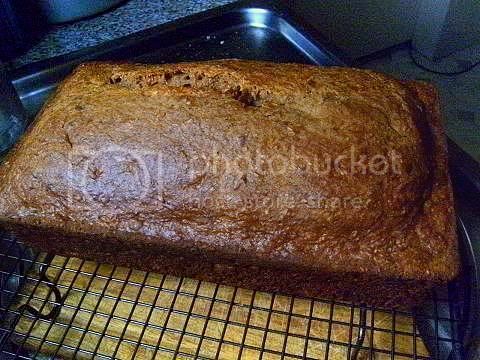 Whisk the ingredients together until a normal "cake" batter consistency is formed you can add more water if you need to loosen the batter. 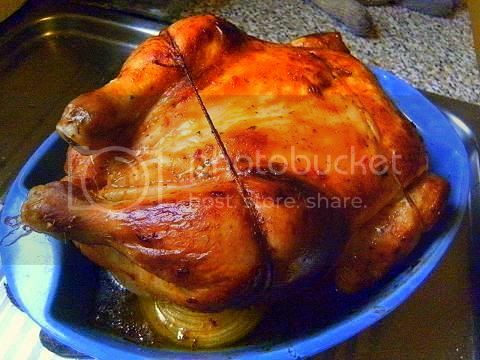 Bake in a moderate oven 160C/320F/gas mark 3 for 1-1/2 hours until a skewer comes out clean, check at 1 hour and then every 10 mins until done. 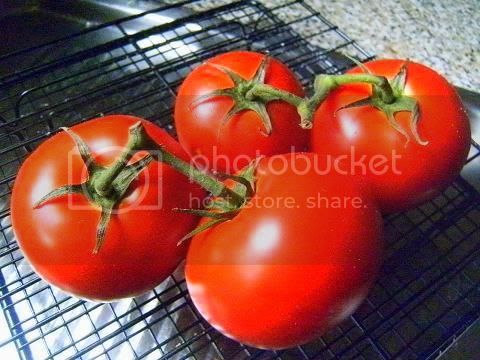 Best if left for one day before slicing, but can be sliced when completely cooled. The bread will last for 2 weeks (at least! 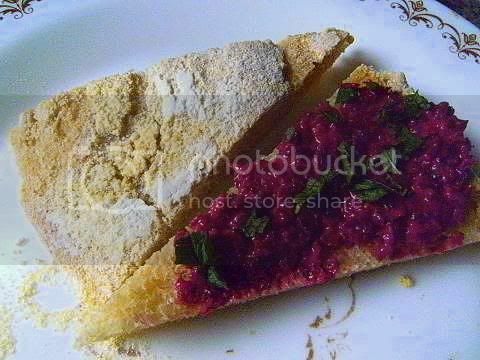 I have always eaten it before this) in the fridge covered in foil and plastic wrap and it gets better and better with time, fabulous toasted and served with butter. The slices are super moist and not too sweet. 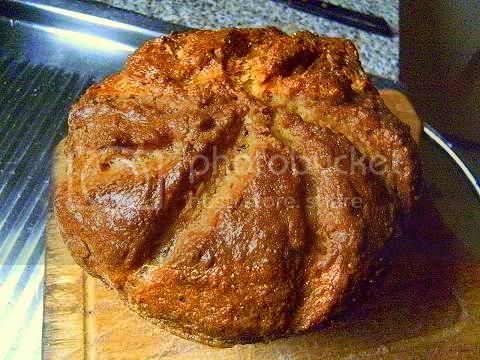 The sourdough and bananas really makes for a moist bread. 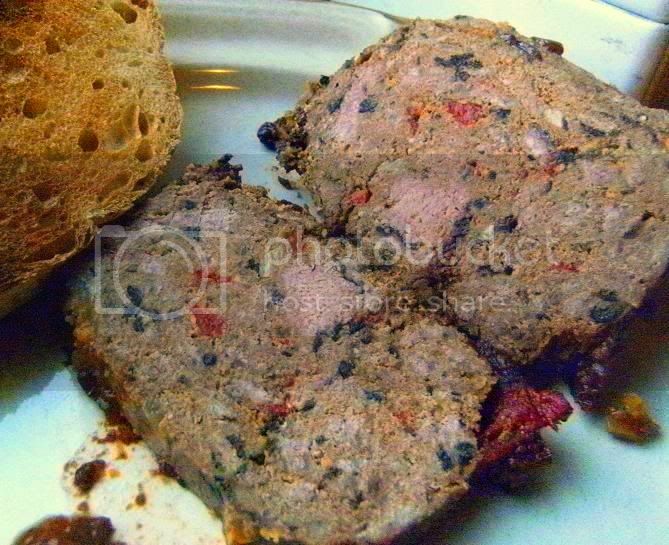 I decided to make a treat for this delicious bread that is meatloaf which I really really like a lot in Australia it isn't that common basically nobody I know makes meatloaf but every time I make it the meatloaf gets rave reviews. 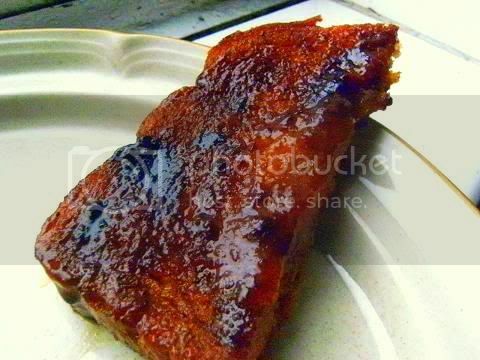 For a super special treat I baked the meatloaf on two slices of the white bread these slices therefore get toasted and are dripping with gorgeous flavour I'm sure that they aren't not that healthy but once in while it is such a flavoursome treat. 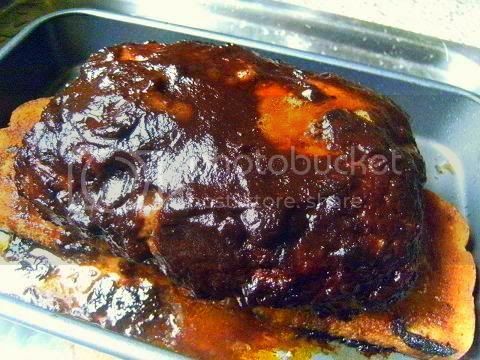 The cut meatloaf. 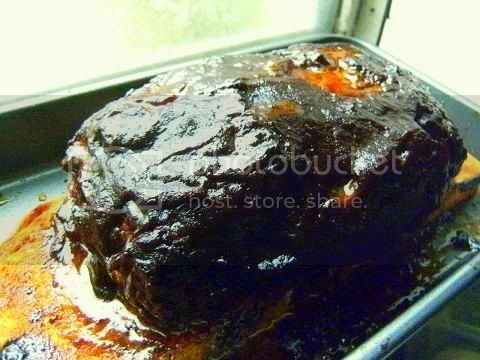 My meatloaf contains grilled red capsicums (the red pieces), shredded seaweed (the black pieces) and lots of herbs and a mixture of pork and veal with some BBQ duck and the glaze is a mixture of tomato pesto, black sugar and balsamic vinegar.